THE CONGREGATION, a new cinema vérité documentary by Alan and Susan Raymond, profiles a progressive United Methodist church in the midst of profound change as it struggles with the arrival of a new minister and must reinvent itself under new leadership. Co-produced by WETA Washington, DC, the film airs Wednesday, December 29 from 9:30 to 11:30 p.m. ET (check local listings) on PBS. Producers Alan and Susan Raymond spent more than two years filming the tumultuous life of The First United Methodist Church of Germantown. 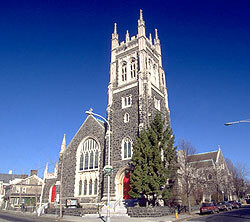 Located in a changing Philadelphia neighborhood, it is a racially mixed urban church with a commitment to a ministry of social justice. Conflict arises upon the arrival of the Reverend Fred Day, a more traditional minister newly appointed to replace a progressive pastor who retired after 37 years of service. The congregation must confront the realities of a divided and dwindling membership and subsequent financial shortfall as they clash over Reverend Day's style of leadership, changes in the order of worship and a perceived shift to a more conservative ministry. The congregation hires outside consultants to determine whether Reverend Day is the proper selection as pastor and to consider new directions for their church. This eight month process causes further tensions within the congregation as they struggle to decide whether their new senior pastor should remain. Another ordeal emerges when their associate pastor the Reverend Beth Stroud announces to the congregation that she is a self-avowed practicing homosexual. Although openly admitting her sexual orientation puts her at risk of losing her ministerial credentials, she receives the full support of the congregation in her challenge of church law. (On December 1, 2004 Reverend Stroud faced a jury of 13 Methodist ministers who voted 12 to 1 to find her guilty of violating the United Methodist Church's ban on self-avowed practicing homosexuals being ordained as ministers. Reverend Stroud's ministerial credentials were removed and she can no longer administer baptisms, marriages or Holy Communion. She remains a lay minister at the First United Methodist Church of Germantown. Despite the controversy, Reverend Day and the congregation continue their ministry for social justice by participating in anti-Iraq war protests at The National Cathedral in Washington, DC and supporting aids victims in South Africa as they host the Sinikithemba HIV Choir. The importance of teaching the congregation's next generation is shown through Reverend Stroud. In her role as youth minister, she guides the confirmation class and escorts the senior youth group on a community service project in Appalachia. THE CONGREGATION presents a microcosm of those mainline Protestant churches which have historically supported such causes as civil rights, racial and economic equality, anti-war movements and full inclusion of homosexuals. Churches like the First United Methodist Church of Germantown, itself a long-time standard bearer for such causes, are challenged by declining membership and by more conservative voices from both inside and outside of their denomination. This is a congregation that must persistently fight for both its liberal heritage and financial stability. THE CONGREGATION offers an intriguing look at the behind-the-scenes work of a church in transition and the intimate stories of its two ministers. It is a complex portrait of a Protestant church moving into the 21st century. THE CONGREGATION is a co-production of Video Vérité and WETA Washington DC.